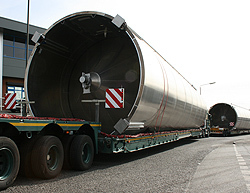 Giant German silos will help Utz UK | George Utz Ltd.
Utz UK has taken delivery of four massive silos that will help it double its production and increase jobs. The Derbyshire firm, which supplies its products to the logistics industry, is installing the giant aluminium silos to store raw material at its Somercotes site. Measuring 20 metres tall and each weighing six tonnes, they will be sited alongside 12 other silos. They are capable of each holding 150 tonnes of raw plastic material - the equivalent of half a million pints of beer. All four silos cost £350,000 and has been transported 600 miles via river, sea and road, from Germany where they were manufactured. The larger factory, which was officially opened in February, has been designed to help increase the company's presence in the food processing, waste management and pharmaceutical markets. More than 600 tonnes of steel and 2,500 tonnes of concrete were used in the building of the extension. As a result of the investment, six new apprentices have started work at the firm. The company has also spent £3 million on robotic and injection moulding technology. Overall, the investment will help create a further 50 jobs in the next five years. During this time, the company also plans to double its turnover. George Utz is the UK subsidiary of the Swiss-owned Utz Group, a worldwide provider of multi-use containers to the automotive retail and supply-chain markets. Across the world, the company founded in 1947 in Zurich, now employs more than 1,000 people and has a turnover of 240 million Swiss Francs across seven production locations on three continents. Managing director Carsten Diekmann said the arrival of the silos in Alfreton was a statement of intent by the company. He said: "The giant silos are symbolic of our investment in the UK, which is one of George Utz's key expansion territories. They will tower over our new facility as a reminder of our growth plans and demonstrate on a daily basis their practical ability to hold the right level of raw material to help us realise our commercial ambitions. This includes becoming a major supplier of complementary products including plastic pallets, which are attractive to industry because they are longer-lasting in the supply chain." Mr Diekmann said that as a result of the expansion a number of new jobs would be created across the business - including some apprenticeships. He said: "We have a strong growth plan and, as part of that, we will be increasing staffing in a number of departments including production, sales, design, project management, finance and, of course, apprenticeships where we are already investing for the future growth of the business."